But I like the word intention. It implies something about purpose, focus and well, intent. I started asking myself, what is my intention right now? My intention has been letting go. Getting excited for a new opportunity. And feeling scared to death of the unknown. I’m going to Guatemala-again! But this time I’m actually taking a year off of teaching. My school district approved a one-year leave of absence. So, I am letting go of a job that I love, friends that I cherish and a community that feels like home because I believe in taking risks, being bold and listening to that still, small voice inside that says “go” even when you don’t know where you’re going. It’s been a year or so of processing, thinking and praying. I’ve justified and allowed myself to make every excuse in the book about why this move doesn’t make sense. This was by no means in my 5-year plan. But I am learning that life isn’t necessarily about 5-year plans. A life of convenience, comfort and control is not a life that I want to live. I have been to Guatemala four times and every time I want to stay longer. Something in my heart longs to be a part of the culture and the language and the people. And I am finally listening to that. I leave June 21st. I’ll be serving with an organization, Mission Impact, that I have worked with before. And I’ll also get to study more Spanish. You can find out more about what I’ll be doing here. Until then, this next month is dedicated to three of my most time consuming enemies: packing, organizing, and moving. Maybe my intention this next month shouldn’t be to dance. sing. floss. travel…but rather, to change. balance. enjoy. trust. 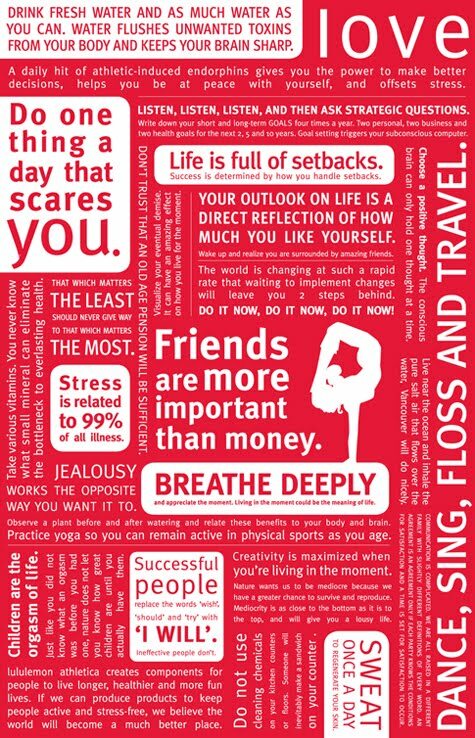 Maybe Lululemon will put my motto on their next reusable bag, hmm? Maybe. That's huge news, Michelle! Congrats! I am really happy for you, and proud of you. I hope your intention is to still blog. 🙂 I'll be reading. This is so great, Michelle. Good job on being brave and not staying safe… I believe both choices are good, but being brave is better. We'll be moving to Argentina at the end of July, so maybe we can begin keeping in touch in Spanish??? Lesley, you're so sweet. Thank you! And yes, my hope is to keep blogging. I'm working on updating my whole page. Krista, I am so excited for you and your family! I'd love to keep in touch in espanol! Michelle, I am so excited for you. I re-read this quote today that was written in my journal, and it made me think of you, and this process of letting go and venturing out:" Creativity flourishes not in certainty, but in questions. Growth germinates not in tent-dwelling, but in upheaval. Yet the seduction is always security rather than venturing, instant knowing rather than deliberate waiting." -Sue Monk Kiddp.s. I am going to miss you.